A common way of discovering people in your organization is to navigate through the department/division/business unit hierarchy to find a person in a certain role or at a specific reporting level. 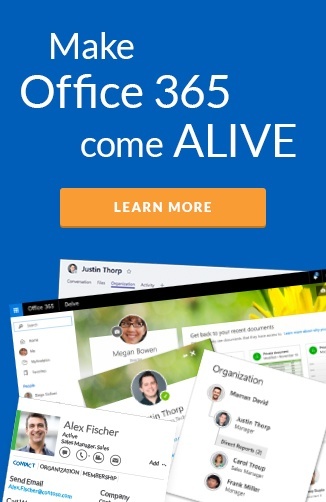 In Office 365, there are many ways you can do this, this blog takes you through all the options. In Outlook, since its initial release, searching the address book has been available via two main methods. You can search the "More columns" and type in a department name or job title or company name and see a flat list of matches. You can also use the "Advanced Find" blue link on the right to be even more specific with your query. Tip: You can change the result set from your company global address list (GAL) to include your own Outlook Contacts or even narrow down your to "All Users" and ignore "Contacts" in the GAL. Contacts in the GAL are usually created for external users who don't have logins for your company. Contacts outside of the GAL, are your personal contacts, appear when you have saved external contacts from email conversations or created contacts on your smart phone and have it set up with Exchange. Once you double click on a contact in the list, you can jump to the Organization tab and see one level above and peers of the individual. This user interface ends up in double clicking on the manager or peer. This launches yet another contact card to see their organization. It can lead to a mess of windows that isn't all that useful unfortunately. 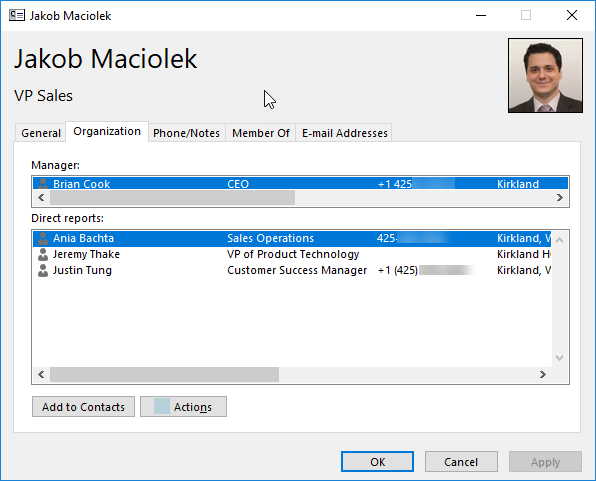 In Outlook, SharePoint, and OneDrive anywhere you see a person displayed on the screen, you can click on them it'll pop up a contact card. This contact card has a "Organization" tab, when you click on that, a side pane shows an organization view. This is restricted to showing a maximum of 4 levels of hierarchy for that employee. 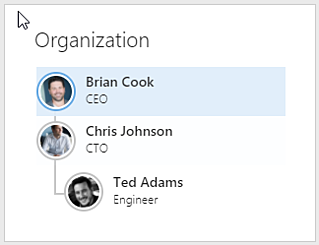 As you click on other people, the organization view refreshes to the context of that person. This makes for speedy discovery up and down the "food chain". TIP: The Office 365 App Launcher has a People app, that can also be launched inside Outlook web too, that has a different view of discovering people that also supports this side pane. Delve can be launched from the Office 365 App Launcher and is more document centric than people centric. But any person you click on within Delve takes you to their Delve profile page. This has a very simple linear organization chart, that shows the management chain but not peers. 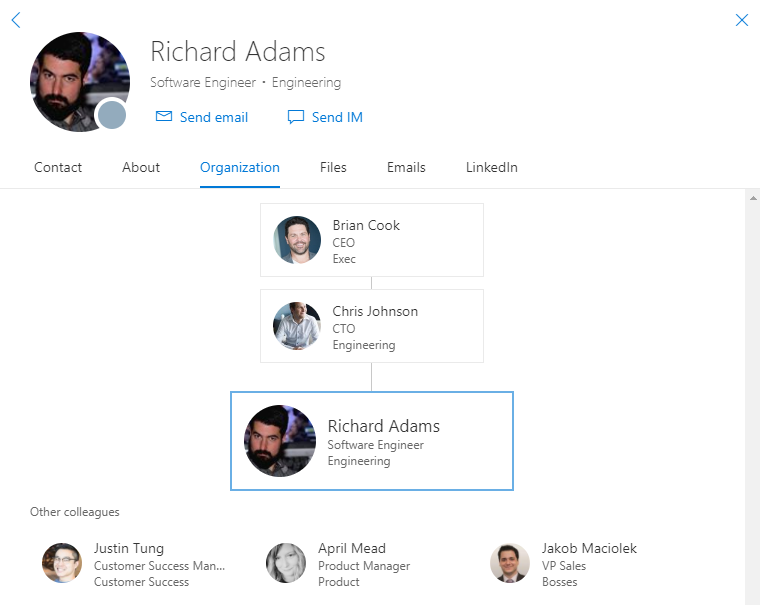 Heads up: Delve was the flagship for showcasing the Office Graph that was introduced after a big push from Microsoft CEO, Satya Nadella. There has not been many improvements to Delve in over 18 months and news around the Windows 10 app being pulled from the store also doesn't show much confidence in its future. 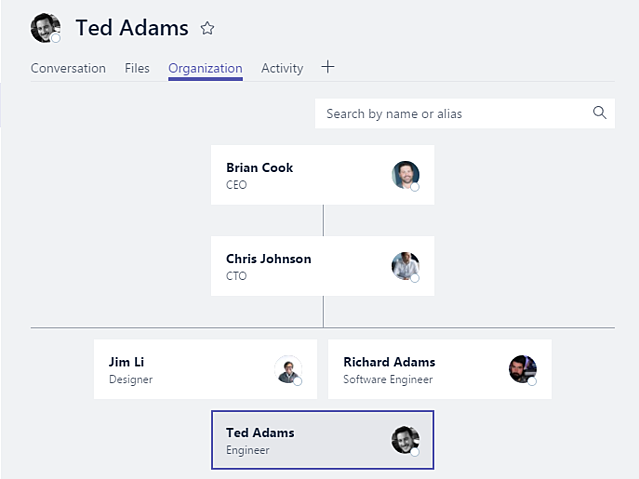 Microsoft Teams is the new darling of the Office 365 ecosystem with a lot of energy behind it. The organazational view for people you click on through the experience shows the hierarchy as well as the peers of the employee. Patiently waiting: the "WhoBot" that was demoed nearly two years ago when they first announced Microsoft Teams is still no where to be seen. The concept was the ability to have a conversation with the bot to find theemployees with the desired skills and expertise. 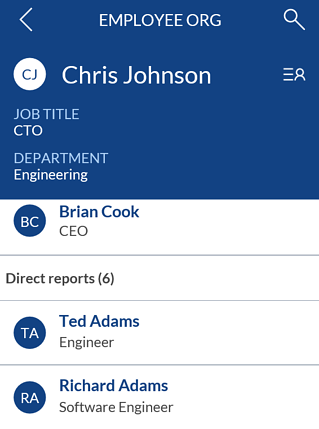 PowerApps has a template app for an employee search mobile app that can be deployed to your enterprise. The template gives you a basic search app that shows information on employees including their manager and direct reports. You can customize this app in the PowerApp designer to include additional fields and tailor the look and feel exactly how you want. It is an extremely basic app that doesn't support photos or click to call capabilities. There are many requests to update this template that have really gone nowhere in 12 months. I wouldn't expect to see any improvements here unfortunately so use at your own risk. 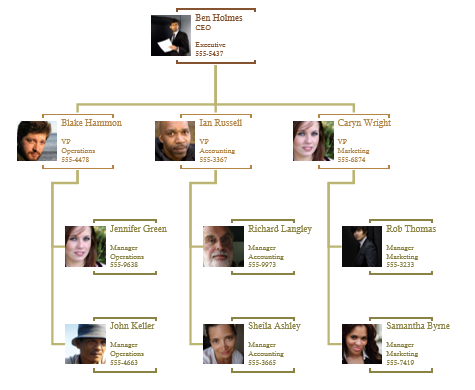 Visio 2016 is still available for desktop, and has a Organizational Chart capability as well. Sadly I couldn't get the import from Exchange to work even after selecting the users in our company. But I did find this nice article on the internet about it. Many customers I talk to are not happy with these approaches. They often want to embed a web part into a departmental page within their Intranet hosted inside of SharePoint Online or add it to a presentation slide in PowerPoint. Sadly there are no real out of the box experiences to achieve this. Many want to see peers on every level of the organizational chart. Microsoft Visio has the ability to create a organization chart based on Active Directory too, but it is not dynamic and you have to re-import when changes occur in the client. I often get asked what other options are out there. Here is a list of solutions I've come across in our customer base. Remember, organizational charts are only as good as the data in your Active Directory. The solutions above all require the manager field to be accurate to even display the hierarchy. In addition to this, without employees' job titles, phone numbers, or department names, there is no information to help you in your discovery. Hyperfish Premium helps you collect all this information off your users in a streamlined way. You can get started Hyperfish Lite for free - to collect and manage your employee's Office 365 profile photos. Jeremy Thake is the VP of Product Technology at Hyperfish. He has over 15 years of experience in consulting, development, marketing, and product management. Jeremy was a SharePoint MVP for five years before joining Microsoft, where he worked on Office 365 extensibility and Azure.